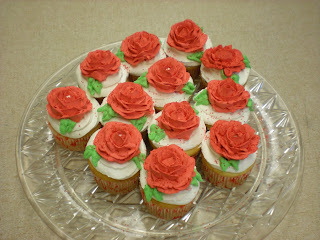 I made these cupcakes for my classmate's birthday. She's 74 and she's become a great friend to me. I love going to class and visiting with her. 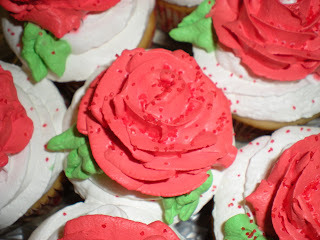 Have a wonderful cupcake day!! I have been doing quite a bit of knitting lately in between cardmaking. My children asked me to make fingerless gloves for them so I knitted a sample (see below) to make sure I got the pattern down pat before I worked on theirs. 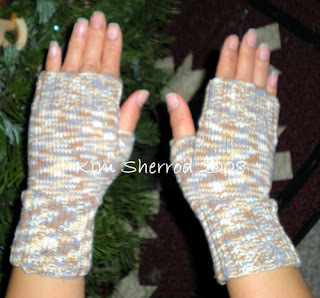 The gloves you see fits my hands, it's a little too long for them, so I adjusted the pattern to their size. They are really quick to whip up. Right now I am working on a hooded scarf. I work on it in the car while hubby drives. That's the only way I could really squeeze in any knitting. I think I will knit a scarf to go with these when I get a chance.